Peter Joseph Knapick obituary. Carnes Funeral Home. Peter Joseph Knapick passed away on August 21, 2018. He was born in Galveston, Texas on June 22, 1926 to John Emil and Mary Josephine (Schindler) Knapick as the youngest of 9 boys. When Pete was 6 months old, the family moved to Houston where he lived the remainder of his life. Shortly after he graduated from St. Thomas High School, he enlisted in the Navy on D Day, just shy of his 18th birthday, and served until WW II ended 2 years later. After his stint in the Navy, he attended and graduated from business school. Pete then went to work for Equitable Life Assurance, retiring after 35 years of service. On July 25, 1947, he married Betty John Cotton at St. Joseph’s Catholic Church where they continued to celebrate Mass each year on their anniversary up until his death. He loved to roller skate when he was younger and transitioned to bowling and bridge later in life. He also enjoyed compiling his iTunes library of music and tracking down his family’s genealogy tracing them back to the Old Country. Pete & Betty raised their 6 children in Houston. He was an active participant in his children’s lives, going on Girl Scout camping trips with the girls and Boy Scouting and Little League baseball with the boys. During his time with the Little League, he began umpiring, served as head of the Spring Branch Little League Umpire Association and taught classes in umpiring. One of his most cherished accomplishments was umpiring at the Little League Headquarters in Williamsport, PA. He was also invited to umpire in the Little League World Series but was unable to do so. He was an active member at St. Jerome’s Catholic Church until his health began failing but continued in his strong commitment to the Catholic faith until his death. He was preceded in death by his parents; his brothers Andy, Joe, Rudy, John, Frank, Albert, William, and Henry and their spouses; and his grandson Jeremy Knapick. 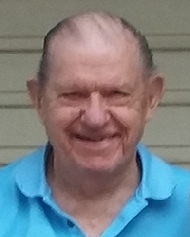 He is survived by his wife of 71 years, Betty; his children, Markay (Larry) Rister of Waxahachie, Karen (Larry) Benka of Houston, Teresa (David) Darby of Nacogdoches, Mary Kinney of Morse Mill, MO, Chris (Rosana) Knapick of Corpus Christi and John (Pamela) Knapick of Channelview; 15 grandchildren, 14 great-grandchildren and numerous loving relatives and friends. A memorial service will be held at St. Jerome’s Catholic Church on Monday, October 15, 2018 at 10:00am. In lieu of flowers, please make a donation to your favorite charity in Pete’s memory.